The island comfortably fits three bar stools (from DWR). Both the backsplash and hood vent are faced with ceramic tile from Stone Tile. Copper hardware from Casson Hardware; millwork by Artcraft; vintage sign above bar area. 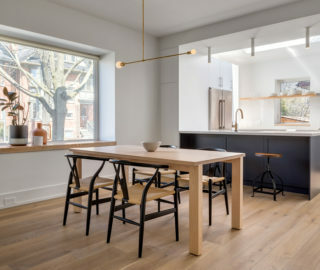 When entrepreneur Andrew Peek and interior designer Stefanie Koerner – then affiancéd – bought their loft conversion in 2018, they loved its sky-high, wood-planked ceilings and rough-hewn columns and beams. However, they didn’t love the corner unit’s seemingly inverted layout or its Arizona-inspired decor. 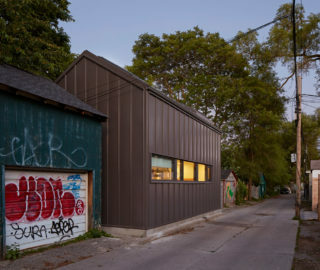 Guests used to enter into a long, earthen-coloured hallway, and had to walk by the condo’s two pokey bedrooms – and two strangely side-by-side bathrooms – before reaching the open kitchen–living space and a view of nearby Trinity Bellwoods Park. 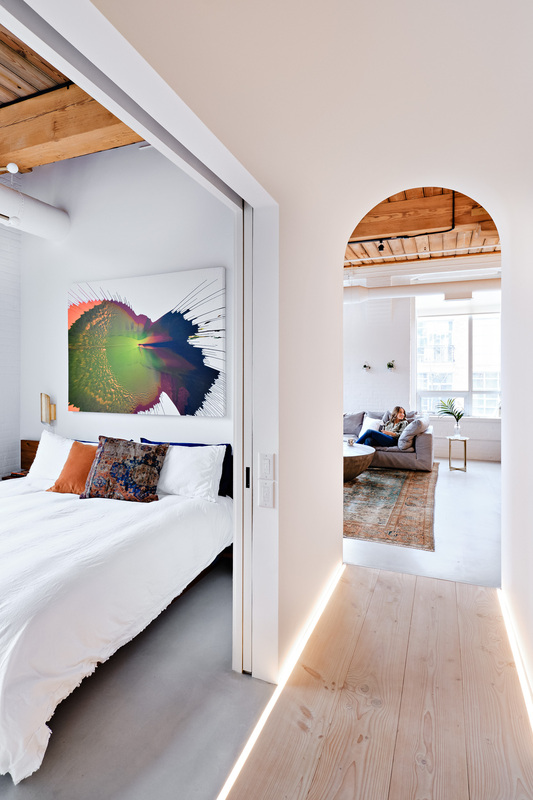 At the time, Peek and Koerner were both working with architecture firm StudioAC on developing a hospitality project – the recently opened Annex Hotel. 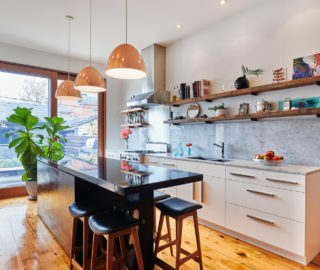 They asked principal designers Jennifer Kudlats and Andrew Hill if there was a way to unscramble the plan of their “terracotta pot” apartment and turn it into a serene, bright urban escape. 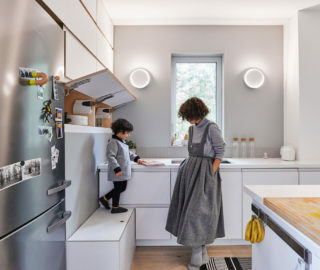 The designers immediately saw the potential, but knew it would require reorienting just about every room in the 158-square-metre unit. “With a condo, people often think they’re stuck with the layout,” says Hill. “But here, other than the perimeter and the location of the tubs and toilets, we basically only left one wall as it was. There was a lot of opportunity for creativity. This is immediately clear in the redesign. Guests now enter an abbreviated foyer, functionally kitted out with a coat closet, access to a bathroom and built-in storage shelves. At the far end, a soft glow begs people to get their boots off and see what’s around the corner. 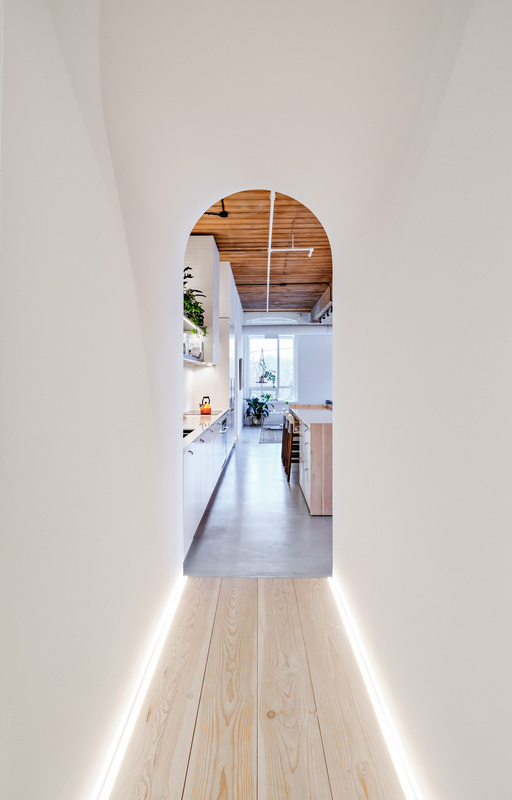 There, they step through a poetic archway to the hall, articulated with whitewashed Douglas fir floors and LED up-lights that imbue the space with an inviting ambience. 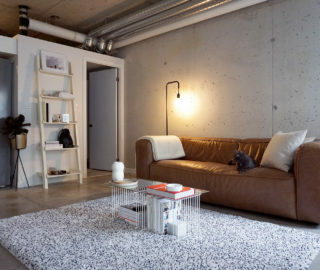 “We wanted a special transition into the main living space,” says Kudlats. 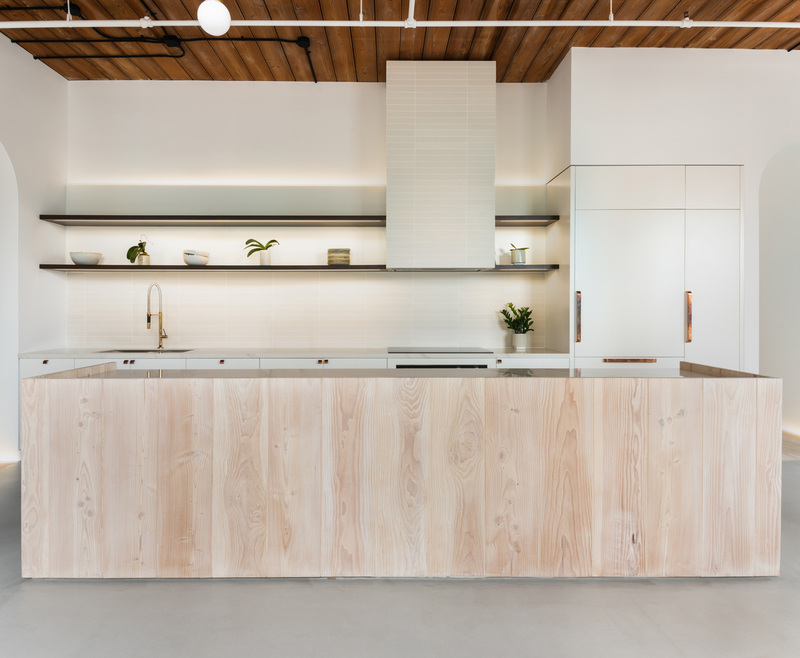 The archway off the entrance leads into the kitchen, where the 3.5-metre-long, Douglas fir–clad island holds court. Past this is the condo’s second archway, which acts as a portal to the master bedroom and ensuite. The coziness of the archway underscores the expanse of the open-concept kitchen, dining area and den – not to mention the leafy vistas through a wall of windows that are no longer obscured by the bedrooms. “In the summer, it’s like being in a canopy of trees,” says Koerner. “It’s so peaceful.” The thoughtful material palette, a strength of StudioAC’s, also amps up the serenity. White-painted brick walls and a pale concrete floor make for a simple, unfussy backdrop, while touches of copper and Douglas fir add a palpable warmth. LED-lit Douglas fir flooring from Dinesen paves the way from living room to master suite. Painting above CB2 bed by Callen Schaub. 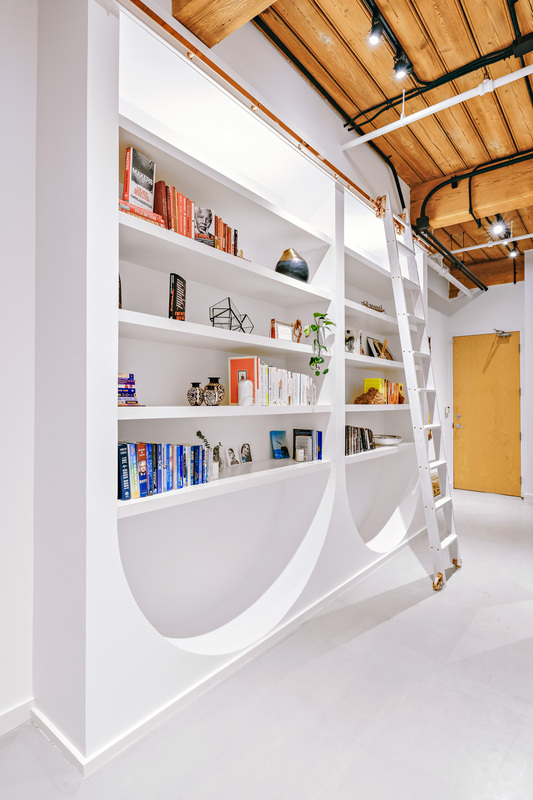 A white oak and copper sliding ladder by 1925Workbench glides across the custom bookcase in the entrance, which was framed on site by Whitaker Construction. Adjacent to the kitchen, another archway transitions into the couple’s completely cloistered new sleeping quarters. Now, they not only have their own private bathroom, thanks to a doorway that migrated from a public hallway, but a walk-in closet lined in rift-cut white oak as well. 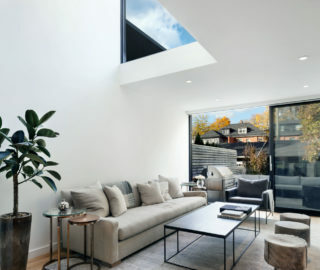 The gracious layout shows what can be done without adding more square footage – just freely reimagining the possibilities within the limits of what’s there. 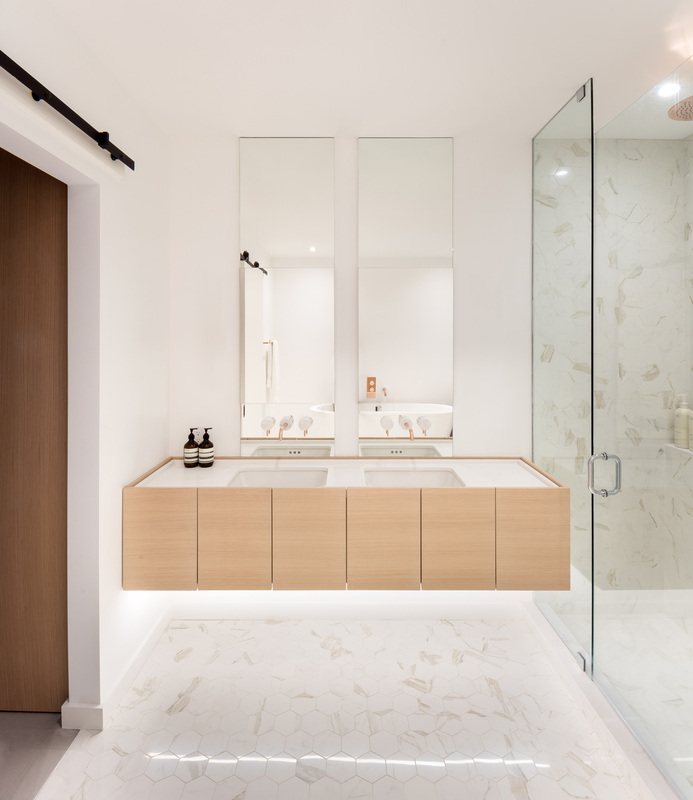 Ceramic tile from Stone Tile covers the floor and two walls of the master bath; Caesarstone tops the floating vanity by Artcraft. Copper faucets by Aquabrass. Originally published in our Small Spaces 2019 issue as The Story of StudioAC and the Suite Transition.